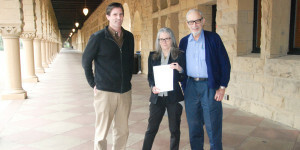 Elizabeth Tallent, professor of English and the lead author of the letter, argued that the moral and ethical responsibilities of the University impelled fossil fuel divestment in order to avert an existential threat to future generations. “If a university seeks to educate extraordinary youth so they may achieve the brightest possible future, what does it mean for that university simultaneously to invest in the destruction of that future?” wrote Tallent in the letter. Paul Ehrlich, Bing Professor of Population Studies, contended that divestment would be an important symbolic step toward addressing climate change as a society. He also called to question the long-term financial viability of fossil fuel stocks due to the possibility of these investments becoming stranded assets – when extracted fossil fuels may not be viably used or sold as global warming intensifies. Civil and environmental engineering professor Mark Jacobson, the final attendant of the meeting, presented statistics showing the negative consequences of climate change along with the high potential of renewable energy sources. He also presented findings showing the bright future of investments in renewables as opposed to those in fossil fuels. Hennessy’s response was largely neutral, according to Ehrlich. Hennessy cautioned the three professors that divestment from fossil fuels would be a “tough sell” to the Board of Trustees. “He was, I would say taking the position that he was an intermediary between us and the Board of Trustees, and the decision was with the Board of Trustees,” Ehrlich said. During the meeting, Ehrlich said that Hennessy emphasized the fact that almost every member of the developed world uses fossil fuels every day. He argued that this would be one factor that would make it difficult to convince the Board to divest. The faculty letter-signing movement began midway through the 2014 winter quarter, according to Michael Penuelas ’15, the faculty liaison for Fossil Free Stanford. With some logistical help from students, Tallent and several other faculty members began collecting signatures for the letter and opened a dialogue on why divestment matters. In January of this year, faculty signatories reached 200, including Nobel laureates, a Fields Medal recipient and tenured faculty members. Since then, the number has grown to 369 signatories. “The diversity of disciplines and views among the signatories is great; what brings us all together is our hope that our University will respond to our call for action by committing to divestment,” Tallent wrote to The Daily.